On the 21st of every month is the “Kobo-ichi", a huge flea market organised at To-ji. Beloved by the Japanese people, Kobo-Daishi, aka Kukai, was a Japanese monk who travelled to Tang China to study the Mahavairocana Tantra, then returned to found the Shingon school of Buddhism. In AD 823 Kubo-Daishi was granted To-ji to be used as a school for the Shingon-shu. Named after Kubo-Daisi, this marketplace within the temple grounds does, strangely though, convey a slight sense of Buddhist generosity. To-ji is most famous for its five-storey pagoda, a symbol of Kyoto. During April and May, taking advantage of tourists coming for sakura and the Golden Week long holiday, the temples and shrines of Kyoto offer each their “Special Exhibition in Spring". Almost every temple and shrine houses a few National Treasures and Important Cultural Properties, normally kept from the ordinary visitors, only to be displayed during special occasions as such, under the name of seasonal special exhibitions. One can expect that it does not cost little to see these special exhibitions. As the normal Japanese are vulnerable to anything “seasonal" and “special", much money are devoted to these exhibitions. To-ji is no exception, other than the special opening of the first level of the five-storey pagoda, the Houmotsukan Museum (Treasures Museum) is also displaying a few Important Cultural Properties art pieces, and the must-have night sakura light-up event (all extra charges required). However on this flea market day, To-ji’s temple buildings were uncannily quiet. Only the passages lined with over a thousand stalls were thronged with people. In the face of the many material objects, even the most devout Buddhist turns secular. Coming in from the east gate, passing through stalls selling ingredients such as tsukemono (pickles), spices, fresh farm produces, sweets and snacks, stalls selling food such as takoyaki, konomiyaki, banana-chocolate etc., by a lonely goldfish stall, at the first junction, there the stalls changed to home utensils, pottery and ceramics, miscellaneous stuff, blocking half of the Houmotsukan Museum. It was a weather unlike April, summer-like mid-day sun shone upon the merchandise, making them brilliant and bright, but at the same time vaporised one’s attention. Too much to choose from, and this made me, a victim of decision-making disorder, feel so dizzy I had to let them pass by my retina like the patterns in a kaleidoscope. Turing left at the corner, another row of fresh vegetables, until I came to a small stall selling kimono. I have always harboured a secret longing for kimono. Yet those sold at the normal kimono shop are not something a traveller without a job can afford, so secondhand kimono at flea markets have become my chief target. 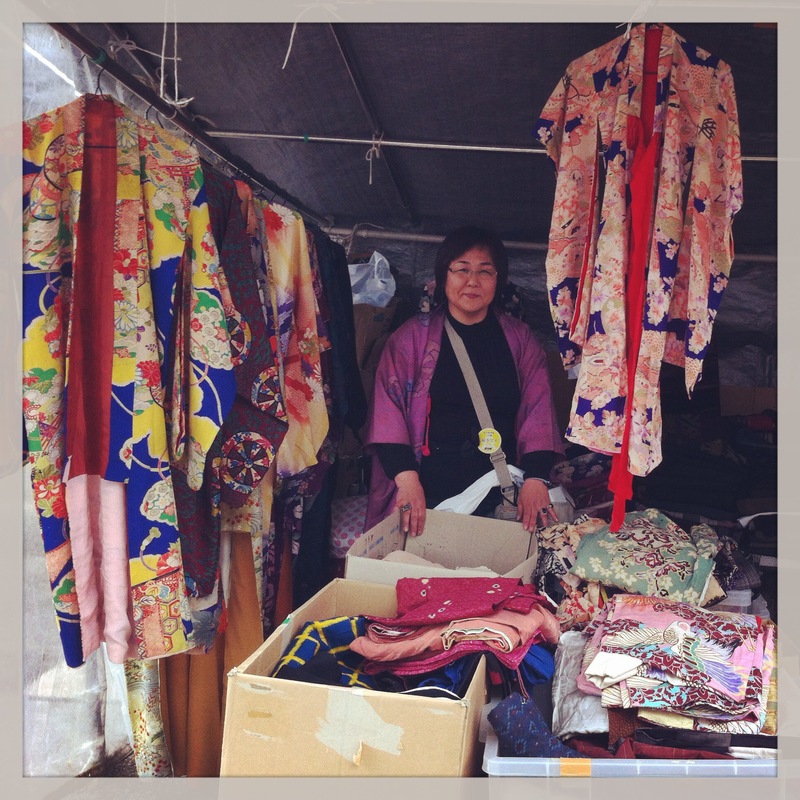 The first kimono stall at the first flea market in Japan immediately set my eyes on fire. Colourful kimono adorned with busy patterns were hung along the frames of the tiny stall, while in the middle of the stall were numerous carton boxes containing more kimono, obi and other accessories. A lady wearing a fuchsia haori stood in the deep shades of the stall. I wanted to take a photo while she was unaware but was immediately discovered. Surprised, then she smiled and stood straight for me to finish the shoot. I got the shot, smiled and nodded at her embarrassed. In the country of manners, no matter what happens, one just smiles and nods, and trust me, that always solves all problems. Indeed Obasan returned a smile, and while I pretended to inspect her merchandise, I realised that I had left my wallet at home, and had only some coins with me. I could only give up on the idea of getting a kimono – I consoled myself by reminding myself that I would soon be moving house and could not afford more luggage anyway. And so I smiled again, then slipped away. Leaving Obasan’s kimono stall behind, I walked towards the south gate, passing along more kimono and other clothing stalls, reaching another corner. Before I turned into the antique ceramics corner, I recognised a stall slightly removed from the main passage. The handicraft material half of the stall was surrounded by a few young girls, but I was attracted by the other half. On the ground was placed several boxes, in which piled old books and magazines. I squatted and began examining the items. My old habit working at the library seized me, and unconsciously I began rearranging the messy pile according to size and content. A young man in a khaki hat and glasses who saw me messing around immediately jumped out and said, “Sorry to have you cleaning up for us." Caught in the act, I was even more embarrassed, and as my Japanese still needed work, I could only smile foolishly back at him. Seeing that I had Soseki Natsume’s Kokoro (Heart) in my hands, he said, “You can have “Kokoro" for 100 yen (marked at 300 yen)." “Really?" I was pleasantly surprised. “Really. From the ‘heart’," he joked. “As a token of thanks for helping." Among those arts and music magazines and books were a copy of “Taiyo" magazine with Yumeji Takehisa as cover feature. But considering that I only had some coins with me, I only took Kokoro. While I was paying I wondered if I should strike a conversation with the young man. I had been in Kyoto almost one month and still had not made any friends. Even if just to ask for recommendations to good bookshops. Yet after repeating several phrases within my mind, feeling very foolish I gave up in the end and slipped away. One cannot be too shy while one is travelling. If I stay this way very likely I will be back to Hong Kong before even speaking Japanese once. Muttering to myself I found amidst the sea of antique Japanese ceramics the only stall not selling that. Above rows of neatly arranged western style white porcelain, a sign said “60-70s white porcelain for export". A small cup with strawberry print for 300 yen, a small oval accessory plate with lace edges for 550 yen, the owner charged me only 800 yen, saying “service" (special offer). It was almost 3pm and many stalls began packing. I followed the crowded and returned to the east gate. With a warm “heart" I embarked on my return journey, while looking forward to the next flea market.